During this event — which will take place over one and a half days — we will review the CERN openlab projects carried out in our fifth phase, with technical discussion of recent progress made. 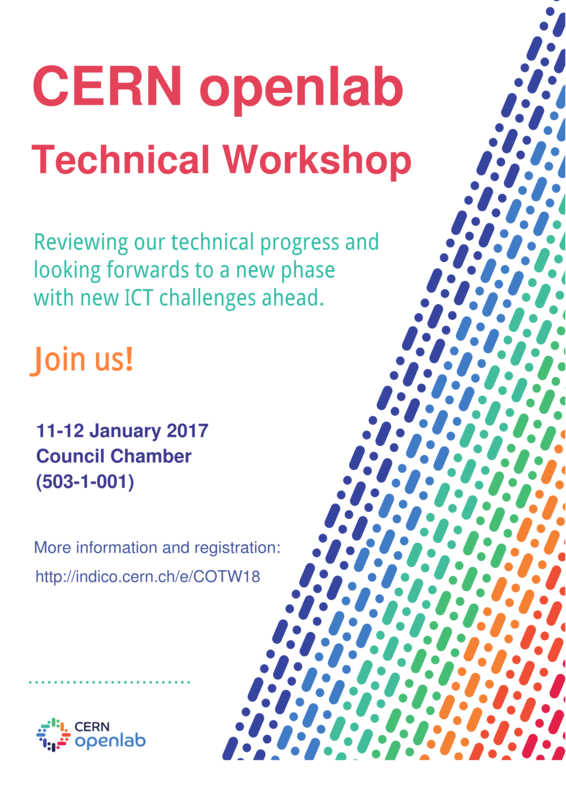 The main focus of the workshop will be to look forward to our future collaboration in CERN openlab's sixth phase (2018-2020), with talks organised into sessions focused on (1) data centre technologies and infrastructures, (2) computing performance and software, (3) machine learning and data analytics. There will also be discussion of potential areas of collaboration across research domains. Visitor badges will be made available to all external participants at the CERN reception, building 33. We suggest you to pick a hotel close CERN, or to the tram line nr 18 ( to CERN) which stops outside the CERN reception (building 33) http://home.web.cern.ch/directions. The Cointrin airport is a taxi journey from CERN (around 35 CHF). All of the hotels mentioned above have a shuttle service to and from the airport (and CERN).